original print | Skinner Inc.
Before cable news and Instagram, Americans saw the top stories of the day, in politics and popular culture, through the colorful images of Currier and Ives. The lithographs of Currier and Ives are iconic representations of American life from 1850 to 1900. They are arguably the most popular, widely reproduced prints in history, continuing to appear on items from calendars and holiday greeting cards to dinnerware. 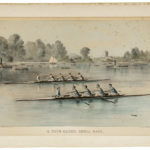 A Four-Oared Shell Race, 1884.